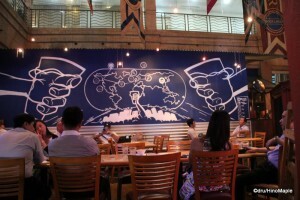 Brewerkz may be the only microbrewer in Singapore. I can’t say for sure but from my research, the local microbrew scene is pretty scarce. Coming from Vancouver, and the Pacific Northwest where the local microbrew scene is huge, it is always difficult to find good beer in the world. Singapore did well with Brewerkz and I’m happy to say that they didn’t disappoint me. While it could have been a bit better, if you aren’t a beer snob as I have become, you will find the beer to be really good. They have their own styles and a lot to choose from and I recommend you head over there, if not for the beer, for the good burgers. Brewerkz focuses a lot on American pub style food with large messy burgers and a really good beer chili. They have a lot for many people but you really have to leave your diet at home when you visit Brewerkz. Brewerkz is a microbrew pub so let’s start with the beer. Brewerkz has a lot of beer on tap and they seem to be really established. They have 6 regular beers and several seasonal beers. Many of the seasonal beers are on at the same time, unlike other brewpubs I have been to which tend to have only one seasonal beer at a time. They follow the same ideas of other micro brews using interesting names and designs. 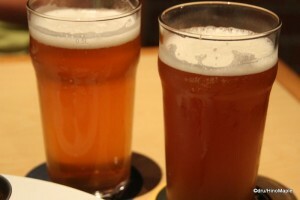 My first beer was a seasonal beer; it was the Honey Apricot Ale. It had the look of an apricot beer, colour wise, and it had hints of apricots and the sweetness of honey. I found it to be a nice beer but not something I would order regularly. I also had a chance to try the Golden Ale which was, to say the least, a standard. While I didn’t drink much of the Golden Ale, the Saviour did that, I did have a chance to try the Hopback Ale. Recently I have been digging hoppy beers. The stronger the hops, the more I like it. I like the bite that an aggressive hop can bring but I do realize that it isn’t for everyone. It is like saying everyone will love tequila. Sure, when you are in University and partying, it seems like everyone is drinking tequila, but not everyone likes it. While it wasn’t as hoppy as it could have been, it was a good mix and went well with Singapore and the heat. I would be remiss if I didn’t mention the food as that was really good too. I ordered way too much food but it was all good. I started off with a Mexicano; it was a basic burger with guacomole, sour cream, jalapenos and beer chili. It was really delicious and made a HUGE mess. I never had such a good chili burger outside of N. America. I have tried a few different ones in Japan but they were always a bit disappointing. I don’t know what they do but they always make mistakes with it and it tends to be too beany. I also had a mushroom pizza and nachos. It was all typical N. American fair and I was happy to be there as Japan almost always messes up N. American food so that I am not completely satisfied. Thankfully Brewerkz did a good job and it was a little taste of home in Singapore for me. The atmosphere within a restaurant makes up a large portion of enjoying the meal and thankfully Brewerkz did a good job with this in their Clarke Quay location. 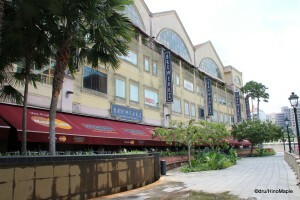 The Clarke Quay Brewerkz is a good shop. If I lived in Singapore, I’d be there every month or so. I could consider it to be similar to how I enjoy going to Devil Craft in Kanda. It is a real N. American style shop with good food and great beer. While it would be better if they had more foreign beers on tap, Brewerkz really needs to expand more with their own beers. They seem to be doing well enough and the servers were all pretty good. They may not know their beer as well as other people, but they don’t really need to know it. Beer isn’t at the level of wine yet, but it will get there as people enjoy more micro brews. 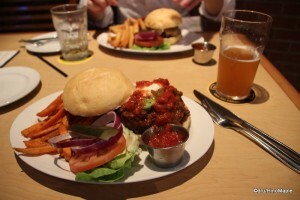 Next time I’m in Singapore, I’m definitely going back to get another burger and some beer. This entry was posted in East Asia Food and tagged beer, Brew works, Brewerks, Brewerkz, Breworks, Clarke, Clarke Quay, craft beer, microbrew, Microbrewery, Quay, Singapore by Dru. Bookmark the permalink. Popping in to say hallo. (No, I’m not dead, just very busy.) I have to — HAVE to — hijack you for a trip to South Africa. SA isn’t just about wine; we have some damn good beer too. PS: Yes, beer or two can work of course. Although we might have to be careful as timing is important.